We’ve developed a plan for Belmore that enhances the town centre with new restaurants and cafes and better walkways to Belmore sportsground. Have your say. Belmore was announced as a Planned Precinct by the NSW Government as part of a housing affordability package on 1 June 2017. Planning for these Precincts is coordinated by state and local governments to help ensure infrastructure such as schools, parks, community facilities, public transport and road upgrades is delivered to support community needs. Burwood Road will continue to be a vibrant popular eat street. Belmore Sportsground will be better connected to the station via a potential new linear park along the rail corridor. Open space around the sportsground will be upgraded. New apartment development will deliver improved streetscapes, new pedestrian connections and more green and urban open space. Belmore Station will be connected to neighbouring Campsie and Lakemba Station Precincts via improved streets and shared pedestrian/cycle paths. 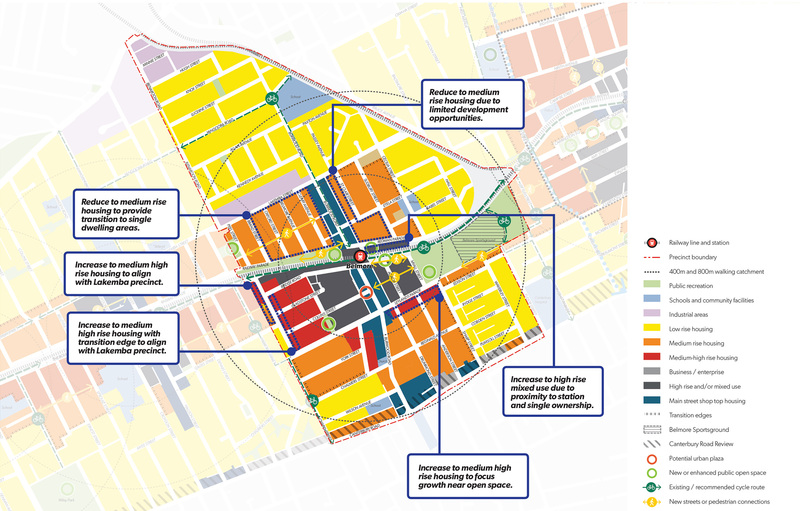 This map shows the key changes that have been made to the Belmore Station Precinct Plan as a result of your feedback. Public Domain and Station Access Plan Sydney Metro will prepare a Public Domain and Station Access Plan for improved station design, accessibility and interchange with other modes of transport. The new metro station at Belmore will provide improved pedestrian and bicycle access. Priority precinct Rezoning Belmore Station Precinct has been identified as a Priority Precinct. DP&E will work with Council to determine areas in the precinct to be prioritised for rezoning. We will use community feedback to produce the final Strategy. Once finalised, we will continue to work with stakeholders to deliver the Strategy and plans over the coming years including master planning and rezoning of Belmore. Protecting Belmore’s ‘family orientated’ character and local heritage is important to you. Increased housing diversity in the Belmore Station Precinct will help people stay in the area as their housing needs change. You support some development and increased heights near the railway station. Traffic congestion and insufficient parking is a concern and should be considered. You would like to see more services and infrastructure to support growth. More detailed information on your feedback can be found in the Belmore Station Precinct Plan.